Catherine Sherwood is a volunteer environmental scientist with Engineers Without Borders Australia. This week we profile Catherine in Changemakers - a regular column which examines inspiring people and their careers in the Not for Profit sector. 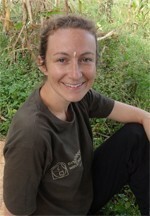 Catherine Sherwood is a volunteer environmental scientist with Engineers Without Borders Australia. This week we profile Catherine in Changemakers – a regular column which examines inspiring people and their careers in the Not for Profit sector. Engineers Without Borders is a member-based Not for Profit organisation which works to create systemic change through humanitarian engineering. I’m a Field Volunteer with Engineers Without Borders Australia (EWB). EWB is a Not for Profit organisation with 10 years experience creating systemic change through humanitarian engineering. One of the ways they do this is by working in partnership with community organisation to address a lack of access to basic human needs such as clean water, sanitation and hygiene, energy, basic infrastructure, waste systems, information communications technology and engineering education. I’m half way through an EWB placement with a water, sanitation and hygiene NGO, Nepal Water for Health (NEWAH). EWB has partnered with NEWAH for over three years and over that time have seen six volunteers travel to Nepal. I’m the second EWB volunteer to support NEWAH’s Climate Change Adaptation (CCA) Program, which aims to build community resilience to the impacts of climate change from the bottom-up. In Nepal, marginal rural communities are being impacted by changing climate including an increased number of extreme events, poor crop yields, increased prevalence of disease and impacts on water supply and quality. Based in one of NEWAH’s regional offices in the west of Nepal, my focus is on working with field staff as they pilot a community-based CCA planning approach and assisting to identify ways in which learnings can be used to focus NEWAH’s CCA support to communities. The program aims to generate awareness, trigger identification of vulnerabilities to climate change impacts and support communities in the preparation and implementation of community action plans with a focus on water supply, sanitation and hygiene. This is it! Although, in my previous life as an Environmental Consultant, it’s fair to say a few of my projects could also have been described as Not for Profit. The name EWB can be a little misleading as we’re not all engineers. My background is more environmental and before leaving Australia I was working in the hydropower sector on the planning of new developments both in Australia and the overseas. Although the majority of EWB volunteers are qualified engineers, there are also roles available for architects, project managers and other technical specialists like me. Working with a humanitarian organisation like EWB was something I’d been drawn to for years, but getting the timing right took a while. Thankfully there’s a strong community within Australia that you can get involved with if you’re interested in aid and development issues. RedR Australia offer an excellent series of training courses that I’d recommend anyone with an interest in the humanitarian sector checkout. Why? Many Nepalis and Australians alike seem a little confused as to why anyone would want to leave friends and family (not to mention lattes and air-conditioning units) and spend a year working as a volunteer in a country with few of the creature comforts of home. Not sure I’ve really come up with a convincing answer yet, but now I’m finally doing it, it’s something I can honestly say I get a lot of satisfaction from. I’ve worked overseas before but only for short periods of time and this is a very different experience with its own rewards and challenges. Biggest reward? Seeing my colleagues pick up new ideas and run with them. Biggest challenge? Consuming the truly monumental serves of rice provided to me by my generous hosts! So far it’s been pretty varied as the Nepali approach to planning seems to be big on surprises. Hence, the neat project plan I worked on when I first arrived is very much a live document! I’m predominantly office based but typically spend one week in five with project communities. NEWAH in partnership with WaterAid Australia and with the support of AusAID, focuses on the most disadvantaged communities, working in partnership with local government to prioritise communities where the need is greatest. Typically these communities are remote and my visits generally involve a commute of around five hours by jeep (roadblocks and lunch stops included) and between three to five hours uphill on foot. NEWAH works to train community members to deliver both the infrastructure and behaviourial changes needed for a project to be successful in the long term. The CCA planning approach we’re trialling uses historical reflection and vulnerability mapping through workshop forums to develop a community CCA Action Plan that the community water and sanitation users committee take charge of implementing. In addition to participating in the workshops I’m helping NEWAH to develop ways to monitor and evaluate the pilots. At the moment I’m pretty in awe of the work my colleagues here at NEWAH do. I’m lucky to be working with a very competent and effective organisation. I’m surrounded by changemakers both within NEWAH and within the communities I have the privilege to work with; they’re the machine that delivers the fantastic outcomes they do. My role here isn’t so much to make change as to provide a little oil to help the change making machine that is NEWAH run a little more effectively. Very inspiring work Catherine is going!